Visit Tanzania and take part in hiking the Kilimanjaro via the Northern Circuit Route on this 8 Days Northern Circuit Route Kilimanjaro Hiking Safari. Contact us to book this safari. Introductions and a short final orientation with your guides take place in the morning at your hotel before the 3 to 4-hour drive to Kilimanjaro National Park’s West gate: Londorossi (2,200 m). The guides will take care of the Park permits and registration formalities. We recommend that you take Diamox pills every morning prior to beginning the climb – this alleviates altitude sickness symptoms. Make sure to consult your physician on the use of Diamox before traveling. This day brings yet another modest altitude gain of 300 m on the way from Shira 1 to Shira 2 Camp. 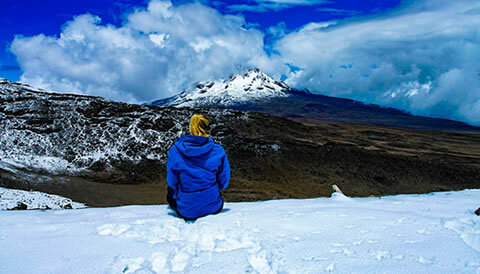 The low physical demands of the trek will leave you with both time and energy to enjoy Kilimanjaro’s flora and- when the weather is favorable- Mount Meru, which is the 5th-highest mountain on the continent. The afternoon part of the route climbs slightly before descending to Moir Hut Camp. Your guide may decide to bypass Lava Tower altogether, taking the porter trail instead, if any of the members of the group do not appear to have acclimatized properly. In this case the highest altitude reached will be 4,400, rather than 4,630 meters. On this day you will be trekking to the School Hut Summit Camp (4,750 m). The actual trekking is not very hard, so remember to just choose an appropriate pace in order to keep your strength up for the trekking to Kilimanjaro’s summit. When you reach the camp, we recommend you sleep well, avoid strenuous activity and drink as many fluids as you can, because that very night you will complete the trekking to Uhuru Peak (5,895 m).